By Louisa McGrath | April 12, 2012. Minister for the Environment, Phil Hogan, has urged councils to collect the outstanding household tax payments. 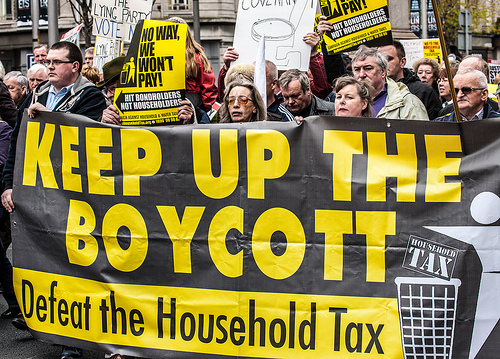 Tina MacVeigh, co-ordinator of the No to the Household Tax Campaign for the Liberties, said “Debt collectors are supposed to have a licence, so the council cannot ask their workers to collect the tax. “Employers have a duty of care to their workers. There are already scams to collect the charge going around, so I cannot see it happening,” she added. An emergency motion calling on Dublin City Council to reject efforts made by the Government to use council workers to collect the household tax was brought forward by councillors at this week’s Dublin City Council meeting. However, Lord Mayor Andrew Montague, did not allow the motion to be debated. Dublin City Council has said that no direction has been issued to it to instruct council workers to collect the tax. Mick O’Reilly, Vice President of the Dublin Council of Trade Unions, commented: “This is not part of a council worker’s contract and, if they say they are not collecting it, they should be supported by their colleagues and by their unions.” The Dublin Council of Trade Unions supported the non-payment of the tax. An estimated 880,433 households have registered for the household tax according to the latest figures from the Local Government Management Agency, the agency in charge of collecting the tax. This figure includes properties with waivers and the postal applications waiting to be processed. The number of households eligible to pay the tax is unclear. 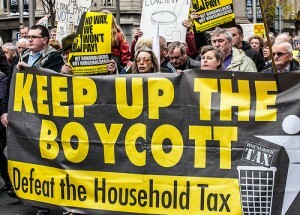 The Government says it is 1.6 million, while campaigners against the tax say the figure is closer to 1.8 million. Photo credit: William Murphy (informatique) on Flickr.